When you are looking to make substantial improvements to any process, you have two options for doing so. The first is to stimulate change from the outside, the other is to make improvements internally. Ideally, we would be able to look at problems in our business and simply throw more time, money, and resources at it until we meet the benchmark we find acceptable. Most of us don’t have that luxury. When it comes to creating content, it often appears that there is a shortage of material to work with, when in reality, small tweaks can make the content you already have more valuable. One area that is commonly overlooked (but offers a wealth of great content) is your sales material. Content marketing is about creating value and establishing a relationship with prospects instead of shoving your sales pitch down their throats, but that doesn’t make your sales material obsolete. Your sales material is the most focused niche of your expertise. Out of your knowledge and experience of the industry, that is the area where you have staked a claim and made a commitment to excellence. You have the answers. Your prospects need them. All that is left to you is to restructure the answers you’ve developed at the end of your sales funnel into a less self-promotional format. Working backwards from your sales material is a great way to take advantage of underutilized content material and connect with prospects in a brand new way. Here are a couple ways to get the most out of your content. Don’t make the mistake of investing time into a great blog post and then forgetting about it. One simple topic can be repurposed several times to improve the chances that it gets in front of the right people. Turn the points of a blog post into a powerpoint and post it to slideshare. Elaborate on your points in an in-depth Ebook. Create an infographic. Make an explanatory video on youtube. People learn in different ways and will search for information in the way that they learn the best. It may seem repetitive to you, but repurposing your content this way will lead to more views and build your company’s reputation as a thought a leader. The end result being an efficient use of the resources you have at your disposal and better online lead generation. Connecting your content offers presents a unified approach that gently guides prospects down the sales funnel. Linking back to previous articles on the same subject allows you to get the most mileage out of your content and also provides newcomers to your website to benefit from work you completed months ago. By linking to related articles, you can keep every post sharp and to the point, while allowing readers the option of continuing on deeper into the topic. Timing and opportunity are critical factors. Refreshing your published content while concurrently producing new content will help you convert on leads and ensure that you meet people at the right time. When people reach the end of your content offer, give them a nudge in the right direction so they can see how to take the next step. Once you tell them what to do, show an example of someone who’s already done it. Don’t leave your readers wondering what they should do next. If you don’t tell them what to do, they’ll probably just end up leaving and forgetting about you. Repurposing your content can make a little go a long way. 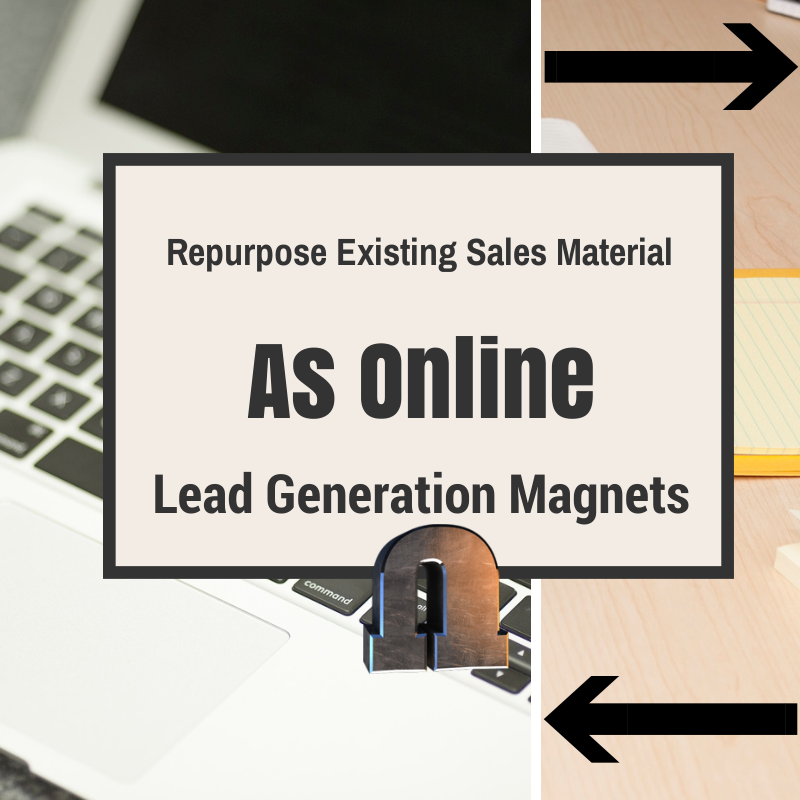 Try it out with your sales content to maximize your lead generation process!